Are you tired of beef or pork? Or are you trying to impress your love or boss with an awesome meal? Whatever your motivation, change it up with some lamb, one of my all time favorites. In the old country growing up, we used to get lamb on a spit – OMG!!! So good. But since we don’t have one in the backyard, a nice juicy rack will have to do instead. 🙂 Every time we make this dish, people love it. Because of the smear, the meat gets this very subtle sweet and tangy taste, muted by the fresh rosemary. We love sautéed mushrooms with this and a nice green veggie or spinach salad. We buy local whenever possible, but always organic grass-fed. Can’t wait to hear from you to see what you think of it. You will need your trusty cast iron pan, and your oven pre-heated to 375 °F. Mix the mustard, salt, pepper, rosemary and 1 tbsp oil well in a bowl and set aside. If the rack is really big and has plenty of meat on each piece then we separate the rack into singles. If it is a bit smaller, it’s better to cut the rack into double or even triple pieces. This way you will still be able to get them perfectly cooked to medium-rare. Heat the cast iron pan to a high heat melting only 1/2 tablespoon of oil. Place the rack pieces on their sides with the bone sticking sideways out of the pan. Now brush the smear onto each lamb chop. Once the first side is nice and browned, flip each chop and repeat the smear. Each side should cook for about 3 – 5 minutes, depending on the thickness and on how many you’ve got piled into the pan. Flip them one more time before shoving the whole pan into your oven. Bake for about 10 – 12 minutes for perfect medium-rare rack of lamb chops. These are so juicy and so good. Enjoy every bite! 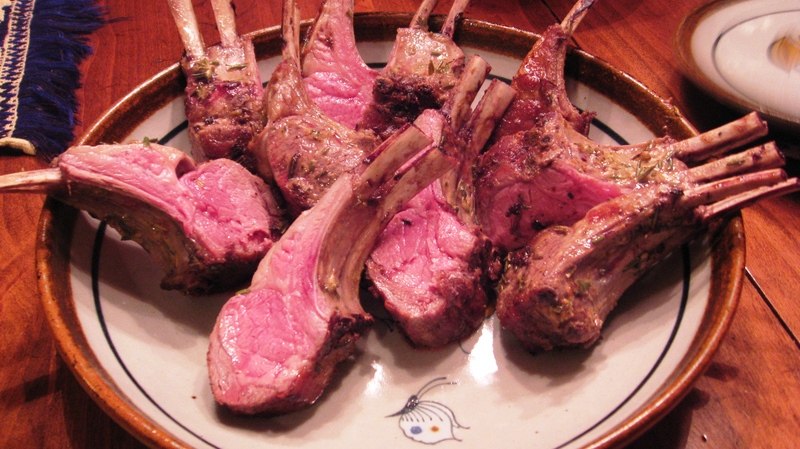 Very few paleo websites have talked about a rack of lamb. I’m glad I have a reference now. Thank you for creating this wonderful website.